I’ve been investigating using my Minimus AVR units for a number of projects, so here is a post with how I got going using the minimus AVR unit with the Arduino IDE. 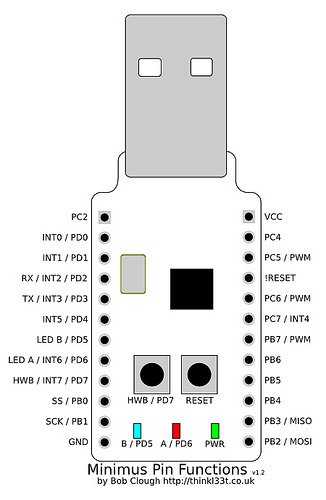 The Minimus AVR is a USB connected microcontroller, which uses the ATMEL 90USB192 microcontroller. This has 16kB of memory (I have a number of version 1’s, the new version has 32kB of memory). I wanted to be able to easily upload simple code to them, even better if I could use the Arduino IDE (which I have already written quite a bit of code for). I found this google group post and followed the instructions from Spencer Owen and Joe Duckhouse (Cheers!). Edit: Also check out Spencer’s own blog post which contains all of this info. There was also a load of info from the folk at Reading Hackspace, available here. Click upload and it will compile then pop up with the Teensy program with button to ‘open HEX file’ Click this and drag it to desktop. Then cancel out of Teensy prog. So I followed these instructions. The first stumbling point was that Ardunio version 1.0.5 was not supported, so I used a previous version of the Arduino IDE 1.0.4, which is the latest version to be supported. Flip (which stands for Flexible In-system Programmer) installed fine. I found I could not connect to the Minimus when I plugged it in, but I found that I needed to select ‘Communications’ -> ‘USB’, as is mentioned later in Spencers post. I converted the ‘Blink’ example. Following the instructions to the letter and it all worked perfectly! I needed to know the pin-out for the minimus and how it compared with the Arduino Uno. Luckily it was already available on the Nottinghack Wiki, here. Also here is a diagram of the pin outs (from Bob Clough). To run the 7-segement LED boards, I needed three ditigal lines. I used the example test code. I wired the 7-segment display to pins 0 (Latch) ,1 (Clock) and 4 (Data), which related to Arduino pins 0,1 and 4, which made things easy. I wired this up and uploaded the code and presto! It worked straight away (although the video I took to prove this was lost with a broken phone…). One problem with the Minimus AVR is that it is only digital – it has no analogue to digital converter. I wanted to read in a temperature. This could be done using a thermistor, but I would need an analogue input. I could use an Analogue to Digital converter, but they cost money and I did not have one to hand. I decided to cheat slightly and use the Dallas 1-wire temperature sensors that I have been using. These are digital devices, so no analogue pin is required. I attached a DS18D20 to PB0 on the Minimus, with pins 1 and 3 grounded and data pin 2 connected for parasitic power mode using a 4.7K pull up resistor, as shown here. The 1-wire library is available for the Teensy within the examples, so will also work with the Minimus AVR. I opened up the example: Examples -> OneWire -> DS18x20_Temperature. I changed the pin number for the one I had connected. To perform testing I wanted to be able to output data as a serial stream and monitor it using a Serial-USB converter. The Serial.Begin() command works to send serial data down the USB port. This is not what I wanted. This code worked correctly to stream “This is a test” over the hardware serial port using pins PD2 and PD3, as shown on the diagram above. Now I had all the code in place to easily use the minimus AVR with Arduino code I have already written. This created a very cheap and easy development platform, the only issue compared to a ‘normal’ arduino is the lack of analogue inputs. The final project was a temperature sensor which can be used to monitor the temperature of liquids, specifically the coolant water for a laser cutter. I will write that up as a specific project when I have finished the prototype. I installed both of these but in Arduino IDE I cannot find the board Teensy 1.0 – it looks like this board selection has been removed. Do you have any new ideas on how to program the Minimus AVR? Or do you know where an older version of the Teensyduino software would be located? Seems like you must use the older versions of Arduino IDE (like 1.0.4) and TeensyDuino (version 1.14).